WOOD is a group show highlighting different approaches to the medium. The exhibition includes sculpture, painting, and prints by Kyle Downs, Nick Edmonds, Rose Olson, Barbara Putnam, respectfully. Utilizing the rich natural color and grain, or the historic techniques of carving and joinery each of the four exhibiting artists is dedicated to the beauty and utility of wood. The artists where selected for this exhibit for the diverse approaches to the medium and their ever so slight similarities in style. Kyle Downs, emerging artist from Brunswick, Maine, combines richly color woods creating abstract wall reliefs. The sections of Oak, Ash, Mahogany, Purple Heart, Yellow Heart, Bloodwood, and Padouk, scraps from previous projects, crate bold Jean Arp like abstraction elevating these “scraps” to beautiful and strong abstractions. His process is intuitive, and the outcome is a confidently constructed combination of mixed woods and criss-crossing grains with geometric and organic formations. In addition to WOOD, Downs is simultaneously having his first solo show at the prestigious June Fitzpatrick Gallery in Portland, Maine. Nick Edmonds, sculptor, working in Sharon, MA, is Professor Emeritus from Boston University. Edmonds studied wood joinery internationally on a SMFA fellowship to Norway, 1969, and Fulbright Fellowship to Japan, 1975. The education achieved aboard was pivotal to Edmonds work transforming his approach from tradition monolithic sculpture learned at the SMFA to multi directional multi-faceted sculpture inspired by historic wood joinery, and Japanese philosophy. Edmonds sculptural compositions walk a fine line between puzzle like construction and recognizable representation where landscapes are often derived from photographs or experience. Rose Olson, painter, lives and works in Beverly, MA. She is professor of Painting and Foundations and Montserrat College of Art. Olson is a colorist drawing inspiration from ever changing natural light to nail polish colors she notices on the T. Her paintings are a composite of layers of translucent paint too numerous to count and at the base of those layers- a birch panel. The grain adds an organic element to her simple linear compositions, but do not dismiss these panels as minimal in their composition. These panels have a life of their own, ever changing depending on the light and spatial relation that can only be seen in person. Olson exhibits her work extensively through the Northeast, most recently a large retrospective was held at Gordon College in 2010. Barbara Putnam, printmaker, is the 2012-2013 Costal Studies artist in residence at Bowdoin College, Brunswick, Maine. She teaches at Saint Mark’s School, where I meet her, and lives and works in Southborough, MA, and Deer Isle, ME. Putnam’s large scale prints, some up to 50 x 60 inches, illustrate her mastery of woodblock carving and printmaking. Her primary focus is on wetlands and fragile, transitional ecosystems as seen her prints of seaweed, water lilies, forest streams, and tidal seascapes. Her prints possess a complexity that beckons the viewer to get lost in the depth and details of the composition. Putnam is currently on fellowship aboard a Barkentine Tall Ship, sailing north of the Arctic Circle where I predict she will be inspired to create glacial woodcuts to compliment arctic-scapes of Rockwell Kent, or Richard Estes. Following the Luminous Landscape, a large group exhibition in 2011 focusing on encaustic, WOOD similarly examines on material by displaying multiple approaches to the medium. 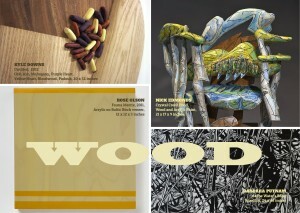 As the curator, I hope this exhibition asks the viewer what would you make with wood? Gallery Contact: Christina Godfrey, ChristinaMaryGodfrey@gmail.com, (508) 667-1062. The gallery is open by appointment.